Ah the F chord, the bane of every beginner guitarist’s existence. Mastering the F chord is one of the greatest challenges in learning to strum basic guitar chords. 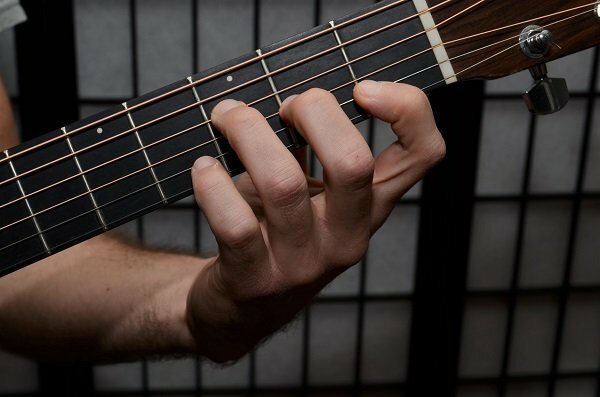 However, much like bar chords, the key to mastering the F chord is finding the right position for your hand. No superhuman strength is needed. 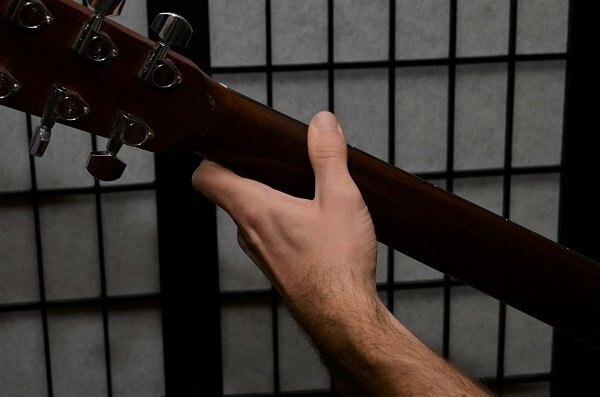 Let’s take a close look at the position your fingers, thumb and wrist need to be in so that you can produce a beautiful, clear sounding F chord. I’ll also give you some ways to work on this chord at the end of the article. (Quick note: this article is written from a right handed guitarist’s perspective. 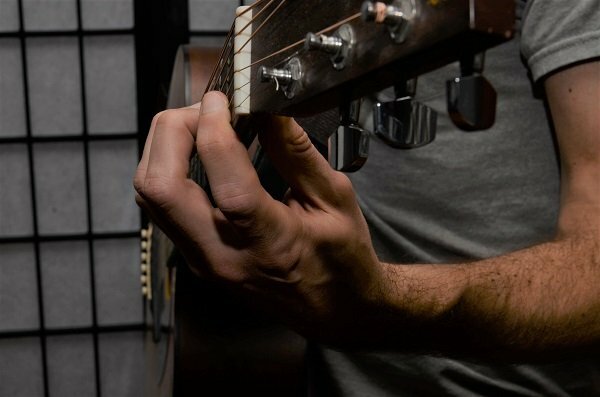 If you play left handed, reverse anything I say referencing the ‘left side of the finger’ or the ‘right side of the hand’ to the opposite. Right becomes left, and vice versa). First, I’ll state the obvious: finger 1 should be flat over the first and second strings. Fingers 2 and 3 need to be curled around, bending at both joints, as much as possible. I’m sure you already knew that. Getting that to actually happen is the tough part. (Hint: the problem is probably in your wrist. See that section further down). It should be rolled over a little bit on it’s left side. Your finger is a little harder on its side than it is directly on the underside, where there is a bit more fat under the skin. This will make it easier to get enough pressure coming down on the strings. 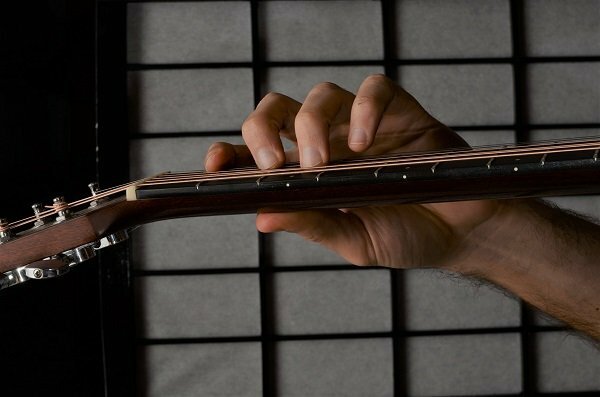 Also, make sure that the first finger is close to the first fret, and running parallel to it. Like anything else on the guitar, the closer you are to the fret, the easier it is to get a clear note. Many students overlook this in their early attempts at the F chord. 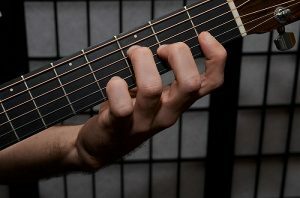 The main difficulty that people face with the F chord is getting the first finger to lay flat while simultaneously curling fingers 2 and 3 so that they don’t touch other strings. Most students will tend to lay fingers 2 and 3 down on other strings since finger 1 is laying flat. Or, they will have difficulty laying finger 1 flat because they are curling fingers 2 and 3. In other words, what they do with one finger tends to cause the other fingers to do the same thing, which won’t work for the F chord. Optimal position for the wrist and thumb will enable you to lay your first finger flat while curling fingers 2 and 3. The goal here is to give the first finger enough room to lay flat, while getting fingers 2 and 3 close enough to their position so that they can curl around. 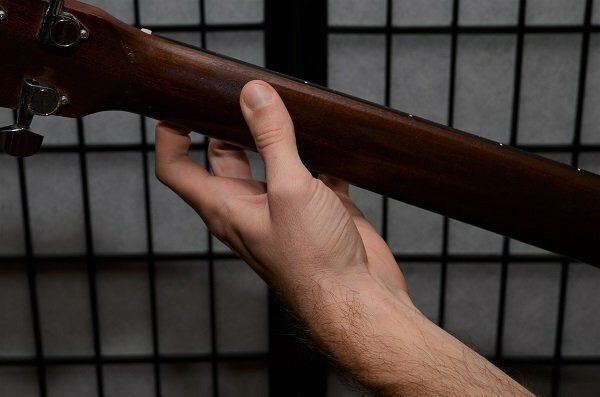 The thumb should be somewhat above the middle of the back of the neck, which will keep the hand close to the bottom of the neck of the guitar. At the same time, it shouldn’t be too high above the middle of the neck, which would make it difficult to spread the fingers enough. The first photo in the next section shows this position. The wrist position is even more important. In fact, I suspect it is the elusive, overlooked key to getting things to fall into place for most students. 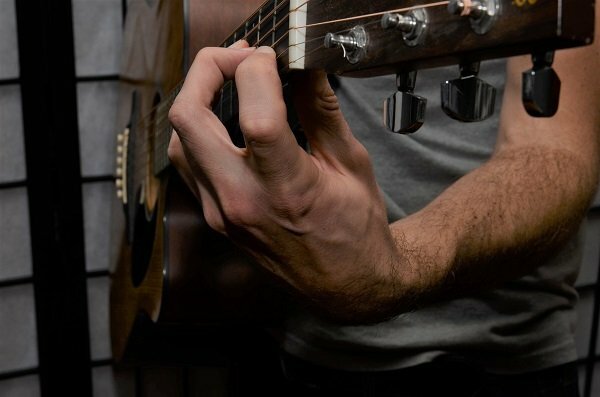 The wrist and forearm need to be turned in a particular way that draws the right side of your hand up toward the neck of the guitar, while drawing the left side (where the first finger is) slightly away from the neck. Now, here is an example of bad wrist positioning. Compared to the previous picture, you can see that the right side of the hand is drawn away from the neck. This will make it tough to curl fingers 2 and 3 around enough. Here is another example of bad wrist positioning. Compared to the ‘good’ photo example, you can see here that the left side of the hand is too close to the neck. This will make it hard to keep the first finger flat. So, I’ve laid out a thorough guideline on how to position everything. Getting all this to happen is still easier said than done, though. Here are some ideas for practicing this chord. I often have students move the F chord up to the 4th or 5th fret. For example, if you’ve moved it to the 5th fret, your first finger would be on the 5th fret, with the other fingers on frets 6 and 7. 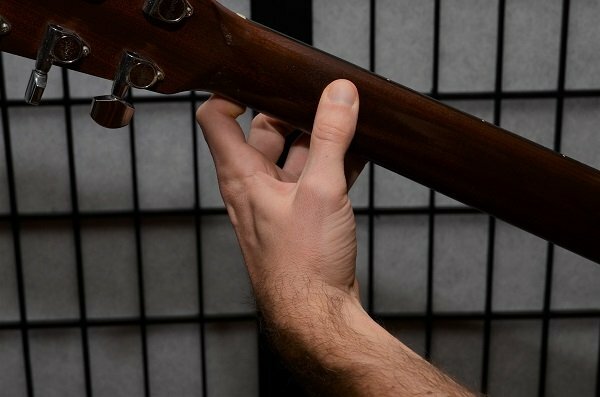 Doing this will help make the chord much easier to do than it would be in it’s usual fist fret position. The frets are skinnier further up the neck, so you don’t have to spread your fingers out as far. 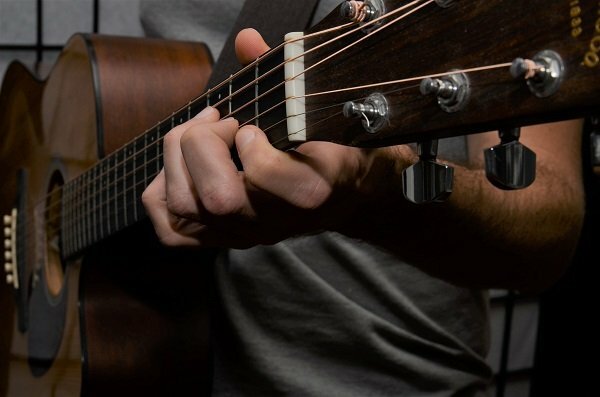 The capo pushes the strings down closer to the frets, so that they don’t require as much pressure to sound clearly. You could work on getting the F chord to sound clear further up the neck like this. Once you’ve gotten clear notes from all 4 strings, move it down 1 fret and repeat the process. 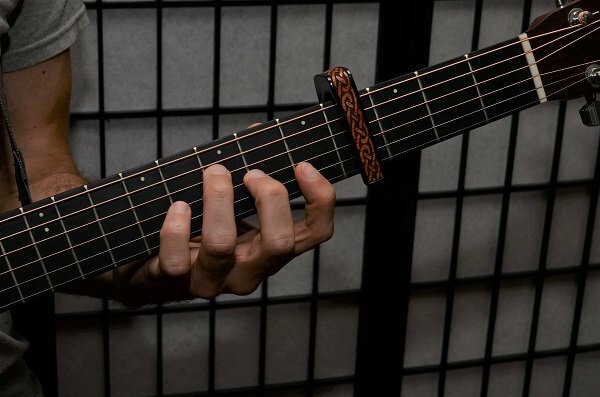 Keep moving it down 1 fret at a time until you reach the first fret. This can also be done higher up on the neck. Start by just putting your first finger down and get clear notes out of the 1st and 2nd strings. Add the 2nd finger, being careful not to let your 1st finger change position as you do so. Work on getting all 3 notes clear. Then add your 3rd finger, working on getting all 4 notes clear. Posted in General Advice, Getting Started, Technique and tagged Beginners, Chords, F Chord, Practice, Technique.